In a world of despots and dictators, it sounds like a fairy-tale that our beloved monarchs have ruled and guided us for years like their own children. Starting from the very day when the institution of monarchy was established in Bhutan, the sun of peace has shone over us and we have been blest with absolute harmony and prosperity throughout the golden reigns of five heriditary monarchs till today. We have always been governed with great love and compassion and we have really been proud of being blest with such divine rulers. It’s obvious that something is special about our kings. The following five reasons would justify why our monarchs are considered spiritual kings or Dharma Rajas who are always guided by Buddhist philosophies and principles. It’s this specialty that makes our kings different from tyrannous dictators who have ruled other nations for centuries. We all know that our kings belong to the lineage of great Tertoen Pema Lingpa who discovered many sacred treasures of Guru Rinpoche in Bhutan in the 15th century. He was the reincarnation of great Buddhist master Longchen Rabjam who was the direct reincarnation of the daughter of the Tibetan Dharma king Thrisung Detsen who was blest by Guru Rinpoche in the 9th Century. The history tells us that when the 8-year-old princess Lacham Pemasel died an unexpected death, Guru Rinpoche resurrected her and blest her with his heart to help her grieving father Thrisung Detsen. Pemasel was prophesied to be born as Longchen Rabjam in the future and then reincarnate as Pema Lingpa in the 15th century to discover his sacred teachings from Bhutan and neighboring places. So, this shows how our beloved monarchs have been connected to Guru Rinpoche, a great Buddhist master who blest the Himalayas during his visits in the 8th century. Unlike the crowns worn by other kings elsewhere in the world, the Raven Crown worn by our kings was first conceived, designed and consecrated by a great Buddhist master of Tibet, Lam Jangchub Tsundru. It symbolizes a popular guardian deity of Bhutan, Legoen Jarog Dongchen who has been believed to have played an important role in securing the sovereignty of Bhutan. It’s believed that even Zhabdrung Ngawang Namgyal who unified Bhutan during the 17th century was invited by this deity in his dreams. So, there’s a strong relationship between the significance of the crown and our kings who wear it. 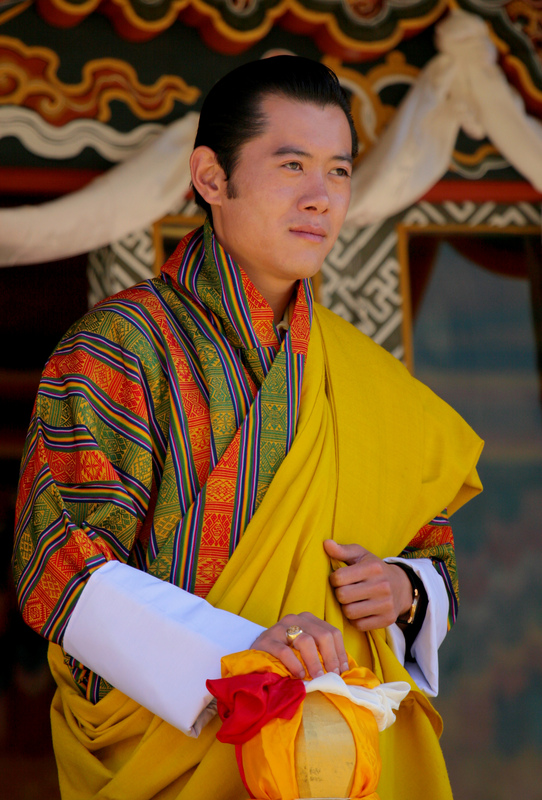 The yellow scarf that our kings wear symbolizes Lord Buddha’s robe and holds a lot of spiritual significance. There is a special spiritual value and religious sentiment attached to it. Wearing the scarf, our beloved kings represent the wisdom of Lord Buddha. We all know that Bhutan has been thoroughly blest by Guru Rinpoche during the 8th century meditating and purifying several caves, mountains and valleys. Hence, we believe that the rulers of this holy land have been prophesied by Guru Rinpoche and other great Buddhist masters. That’s why we call our king Lungten chen gyi gyalpo, which means “The king of prophecy” and they have all proved it, of that we have no doubt. Our kings have been so loving and compassionate towards their subjects. Wherever they have travelled, they have reached the hearts and souls of Bhutanese people and have been constantly taking care of their needs. His Majesty the 4th King and His Majesty the 5th King are the living examples of this value. Our kings love us like their own children and we love our them as our parents. This is the true essence of Buddhism. We all believe in cause and effect (le jung drey) and loyalty (Tha damtshi). This is what makes us a unique nation blest with divine kingship. Acknowledgement: I got these ideas from the spiritual talk given by Lam Kunzang Dorji of Jangsa Animal Saving Trust in DYS auditorium yesterday afternoon. So, I would like to heartily thank His Eminent Lama Kunzang for such a wonderful wisdom and knowledge.